PhoenixSim is an OMNeT++-based simulation environment being developed by the Lightwave Research Laboratory at Columbia University in the City of New York for designing and analyzing the performance of photonic interconnection networks. 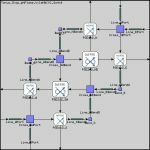 PhoenixSim enables detailed studies of electronic networks, photonic networks, and hybrid networks (ones that leverage a combination of both technology domains). The simulator is highly extensible and is currently being used within the Lightwave Research Laboratory on projects for the design of on- and off-chip photonic communications for multi-processor systems, and the design of nanophotonic optical broadband switches (NOBS). Currently, the simulator supports the ability to model and characterize many important properties of photonic interconnection networks including propagation delay, insertion loss, extinction ratio, spectral resonant profiles, area occupation, and energy dissipation. Moreover, future extensions will support the modeling of thermal variations, optical nonlinearities, as well as three-dimensional integration. In the realm of electronics, the simulator includes a router model that can be used to model advanced electronic networks and hybrid networks.